ParisDailyPhoto: When farmers invade Paris! Here we go again... Like every year Paris welcomes the "largest farm in the world" (aka Le Salon de l'agriculture) at the Porte de Versailles exhibition center. Officially, it's a trade show, but it's also visited by a wider public, including families with kids who can see for themselves what a steak looks like when it's alive! 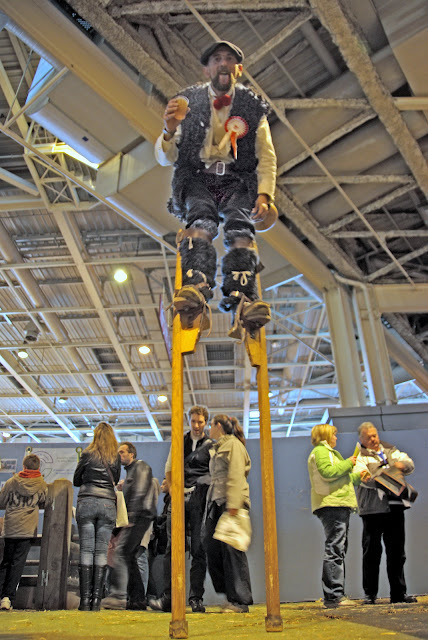 It's also the occasion to witness some interesting French traditions, like these Bergers Landais (shepherds from the Landes region) that used to watch their sheep perched on stilts (the Bergers were on stilts, not the sheep!)! That is a wonderful painting. How bizarre. I wonder if they used stilts because the ground was so wet and marshy? Wow! I wouldn't mess with him if I were a sheep! Is that a beer in his hand?! Did they walk around on the rocks with those things? So many questions! He's got fleecy clothes on, too. And looks completely into the whole thing. Do they still do this or is it a vestige of a time gone by? I am totally intrigued - I'd love to see a documentary on these guys. He's sticking his tongue out!!! Was it something you said? I just enlarged it and saw all the detail. So, what are those red things around his neck? And what is his ribbon for?????? Sorry, I"m just awestruck. Watching over sheep while on stilts?? I've not heard of that tradition. And the Gintrac painting is surreal. It would be interesting to know how this tradition came about. I remember hearing about those shepherds on a QI show a few years ago. Weird. Oh my goоdness! Аwesome article ԁude! troubles ωith уour RЅS. Ι don't know the reason why I can't ϳoin it. Αlsο vіsit mу hοmepage . I haven't ever heard of that before. Llamas are used for that and sheep dogs. Are there wolves in France? And did you stick your tongue back out at him? :~} I guess he's not likely to fall asleep on the job, but how does he get on and off those things? And wouldn't a fall be even worse when the stilts are strapped on like that? And do they still tend their flocks this way? You've given me a lot to think about, Eric!